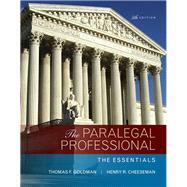 by Goldman, Thomas F.; Cheeseman, Henry R.
For courses in Paralegal Studies. Since the publication of the First Edition of The Paralegal Professional : The Essentials , the paralegal profession plays an increasingly more important role in the delivery of legal services. The Paralegal Professional : The Essentials provides students with the conceptual knowledge, analytical skills, and firm understanding of ethical issues they need to succeed as paralegals in today’s legal environment. The book is shaped by insights of real legal professionals with whom paralegals work to offer relevant information for use in the workplace. The text illuminates specific tasks and roles paralegals will play in the workplace to fully prepare them to enter the field. The Fifth Edition builds a foundation of knowledge which students can augment as they work towards a profession in the field of law. Thomas F. Goldman, JD, is Professor Emeritus of Bucks County Community College, where he was a professor of Law and Management and Director of the Center for Legal Studies and the Paralegal Studies Program. He was a member of the Paralegal Studies Advisory Board and mentor at Thomas Edison State College, where he developed an Advanced Litigation Support and Technology Certificate Program in the School of Professional Studies, and implemented the online paralegal studies program for the New York Times knowledge network. He is an author of textbooks in paralegal studies and technology, including Technology in the Law Office, Accounting and Taxation for Paralegals, Civil Litigation: Process and Procedures, Litigation Practice: E-Discovery and Technology, Abacus Law: A Hands-On Tutorial and Guide, Real Estate Fundamentals, and SmartDraw Tutorial and Guide. An accounting and economics graduate of Boston University and a graduate of Temple University School of Law, Professor Goldman has an active international law, technology law, and litigation practice. He has worked extensively with paralegals and received the award of the Legal Support Staff Guild. He was elected the Legal Secretaries Association Boss of the Year for his contribution to cooperative education of encouraging the use of paralegals and legal assistants in law offices. He also received the Bucks County Community College Alumni Association Professional Achievement Award. He has been an educational consultant on technology to educational institutions and major corporations and is a frequent speaker and lecturer on educational, legal, and technology issues. Henry R. Cheeseman is Professor Emeritus of the Marshall School of Business of the University of Southern California (USC), Los Angeles, California, where he was a professor of business law and Director of the Legal Studies in Business Program. Professor Cheeseman taught business law, legal environment, corporate law, securities regulation, cyberlaw, and ethics courses in both the Master of Business Administration (MBA) and undergraduate programs of the Marshall School of Business of the University of Southern California. He received the Golden Apple Teaching Award on many occasions by being voted by the students as the best professor at the Marshall School of Business. He has also served at the Center for Excellence in teaching at the university. Professor Cheeseman has earned six degrees, including a bachelor’s degree in finance from Marquette University, both a master’s in business administration (MBA) and a master’s in business taxation (MBT) from the University of Southern California, a juris doctor (JD) degree from the University of California at Los Angeles (UCLA) School of Law, a master’s degree with an emphasis on law and economics from the University of Chicago, and a master’s in law (LLM) degree in financial institutions law from Boston University. Professor Cheeseman is an award-winning author of several business law textbooks published by Pearson Education, including the definitive and highly regarded Business Law. Other business law and legal environment textbooks authored by Professor Cheeseman and published by Pearson Education include Contemporary Business Law, Legal Environment of Business, and Introduction to Law. In addition to being a coauthor with Professor Thomas Goldman of the fifth editions of The Paralegal Professional and The Paralegal Professional The Essentials, he is also coauthor of Contract Law for Paralegals and Business Organizations for Paralegals, all published by Pearson Education. Appendix B National Federation of Paralegal Associations, Inc.